Our cooking program consists of staff and participants researching recipes and choosing those recipes that they would like to make. This program directly benefited from the cookie and bake sale at Christmas time. Many of the participants assisted in making items and took great pride in doing so. 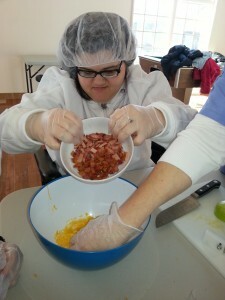 They learn basic nutrition and food preparation, and develop basic cooking skills. It promotes social interaction among peers and teaches skills in cooperation and sharing. This section encompasses a wide range of different activities that the participants participate in depending on the time of the year and weather conditions. Our Arts & Crafts program provides a way for individuals to express themselves, especially when they are unable to write down their thoughts and feelings or communicate them verbally. Art also encourages individuals to develop their creativity and can be used to entertain adults of all ages. Watercolors, canvas or fabric painting, educational coloring, scrap booking or making jewelry from beads are just some of the art activities that our participants enjoy doing. Exercise and physical activity helps our participants to reach their potential, both physically and mentally. Indoor or outdoor activities take place within a normal environment. 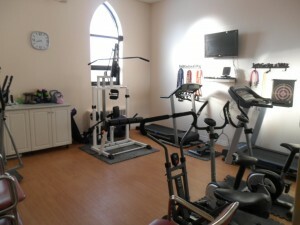 Many of our activities include swimming, dance therapy and other aerobic activities. The use of the WII system allows all of our participants to have friendly games against each other and staff. Visual and tactile techniques are used when giving individuals instructions on how to do something they’ve never done before. Staff uses the same rules and strategies they would for a person without a developmental disability whenever they can. 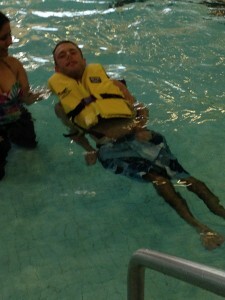 This allows our participants to perform physical activities as independently as possible. Support and assistance is provided when needed, but still allows individuals plenty of opportunities for personal growth. The participants of Harmony love to be able to go on the nature walk trail outside of our building. These nature walks give individuals the opportunity to be out in the open air while learning more about the world around them. Scavenger hunts encourage them to find and identify things in nature; plants, insects, trees, birds and other wildlife. Some of the outdoor recreational activities that we offer during weather permitting days include swimming, gardening, exploring the different parks around us, playing bocce and shuffle board, playing baseball or having our own outdoor summer Olympics. These activities offer our participants a way to socialize outside of their homes. For many, being part of a group is not only emotionally satisfying, but it also allows them to share a part of themselves with others. Harmony in Action has participants that attend daily with a wide variety of functioning levels and for that reason our smart board room is used on a daily basis. For example, some of our clients handle math well but are not so advanced in other subjects, while others are great with money skills but cannot grasp mathematical teachings. This creates difficulties in teaching to different needs. Staff must rearrange the group by subject and functioning level, as well as prepare the information so that each level meets their individual need. Teaching our clients life skills is an essential task. We do not want to decrease our ability or the effectiveness of teaching these skills because of the challenges of having such a diverse group of clients. 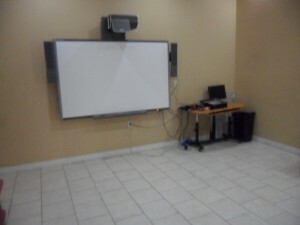 Having a SMART Board helps us tremendously with keeping up with individual requirements. In obtaining a SMART Board, we are able to organize different levels of each subject in disks for the computer, resulting in less preparation time and a more efficient teaching environment. The SMART Board is easy to use, when the lessons are set on the board the participants can write on the board with their finger or the marker whichever easiest for them. The SMART Board makes it easy for group activities each day. The SMART Board allows the staff to reinforce skills using online interactive websites, and develop more computer skills. 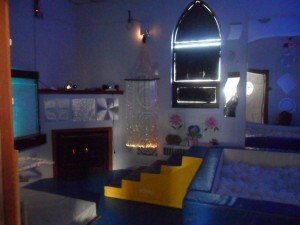 A Snoezelen Room is a multi-sensory therapy room. It is a non-threatening environment for children and adults with disabilities or other limiting conditions. Participants experience self-control, autonomous discovery, and exploration-achievements that overcome inhabitations, enhance self-esteem and reduce tension. Snoezelen Rooms can be used to stimulate, relax, calm or energize. This room allows one to forget about the stresses and problems of daily life. It helps participants feel free from the pressures of living with a disability and they are able to become detached from their medical diagnosis and known limitations. Snoezelen Room’s do this by providing various stimuli for the five senses. Snoezelen rooms incorporate dimmed lights and a calming atmosphere. This is achieved by using use such stimuli as mobiles, bubble tubes, lights, cushion floors, music and tactile objects. These multi-sensory rooms have been proven to decrease negative behaviors, improve memory and vocalization, decrease feeling of pain and improve one’s general mood. By their very nature, Snoezelen Rooms have been shown to be beneficial for individuals living with disabilities.